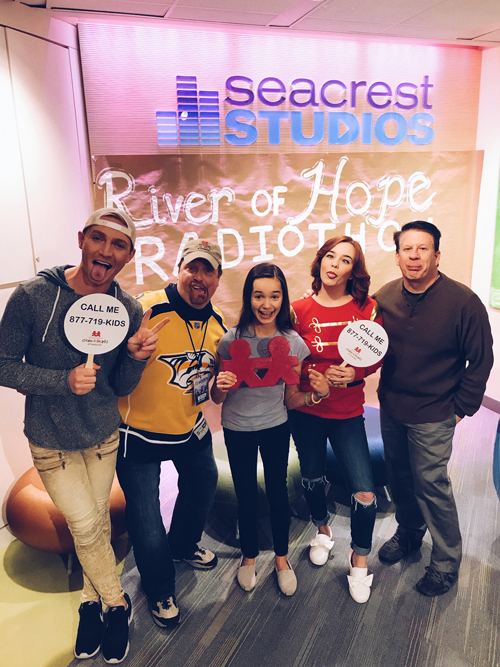 The River of Hope Radiothon, which has aired on WRVW-FM 107.5 The River for 13 years, broadcast live from Seacrest Studios at Monroe Carell Jr. Children’s Hospital at Vanderbilt in December 2017. On-air personalities interviewed patients, families and hospital staff about their experiences, and listeners made pledges to benefit the hospital. The annual event raised $183,481. This year, special guests included singer Khalid, Nashville hockey player Nick Bonino and singer RaeLynn. Pictured here are Zac Woodard, Woody Wood, Savannah Grimm and Jim Chandler of 107.5 The River with miracle ambassador Jessica Meyer, center.